Should you wipe away your sweat, or does that keep you from cooling down? Is it a good idea to mop your brow? Sweating is good. 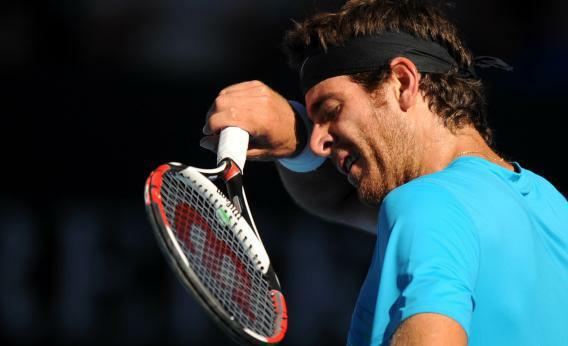 Just ask Juan Martin del Potro. A heat wave gripped the northeastern United States this week, as temperatures rose into the upper 90s. With all that sweat beading on foreheads from Washington to Boston, one Explainer reader wonders: Should you wipe away your sweat, or does that just keep you from cooling off? Don’t wipe unless you’re drenched. Sweat releases heat by evaporative cooling. As each gram of sweat transitions from liquid to gas phase, it absorbs 2,427 joules of energy from the body and dissipates the heat into the environment. But if you wipe away the perspiration before it evaporates, that process will get cut short, and you’ll need to sweat more just to achieve the same degree of cooling. On the other hand, any sweat that drips to the ground before it can evaporate won’t do you any good, so if you’re really soaked you may as well reach for the towel. You may have read that fit people sweat more than their out-of-shape peers, because their bodies cool themselves more aggressively or more efficiently. Studies have shown, however, that fit and unfit people sweat at similar rates when pedaling stationary bicycles at the same speed. In fact, personal sweating rates seem to vary with heat production, body mass, and body surface area rather than fitness level. This week’s heat wave may have been uncomfortable, but taking refuge inside your air-conditioned home is a poor long-term strategy. The more time you spend in hot environments, the better your body gets at handling the heat. Your maximum sweat rate increases, your blood plasma—the fluid from which perspiration is drawn—increases in volume, and you lose fewer electrolytes in your sweat. But if you really want to exploit the full potential of your sweat glands, drink hot beverages. An ice-cold glass of water briefly lowers your core temperature and feels good on a hot day, but it’s only a temporary fix. Drinking a hot cup of tea will warm you up inside, but it will also make you sweat, and the increase in perspiration more than compensates. Explainer thanks Ollie Jay of the University of Ottawa. Thanks also to reader Gabriel Mann for asking the question.